2. For shady areas, provision should be made for a Remote Solar Panel. If you want solar lighting for accents along a path or walkway, choose lights that give a smaller, softer light and space them farther apart. 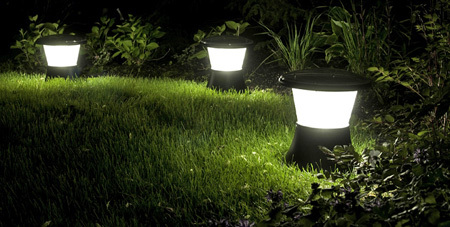 If more light is needed, position the solar lights closer together so that they overlap more. Generally speaking, smaller profile lighting for residential projects should be spaced 6 - 8 feet apart, while commercial applications requiring more light should be placed 4 - 6 feet apart. Before you actually purchase solar lighting products, figure out how many lights you need. Measure your space and mark the location for your solar lights. You can use garden stakes, sticks or plant pots to help you identify locations. Step back, admire your work and make adjustments. Sometimes the smallest change in height or location can make the biggest difference. Lighting design comes down to two things: personal preference and lighting needs. Scroll through our catalogue and you'll see many applications of free-light solar lighting products in use. Our customers often send us photographs of their new free-light solar lighting landscapes, and we encourage you to do the same.